Some players aren't good enough - Ethan's away days and Player Ratings! An early start to the day for what would sure to be a tough test at the Pirelli Stadium. Charlie Wyke made his first league start for Sunderland, Bryan Oviedo returned after serving on international duty with Costa Rica, he came in for last week's man of the match Denver Hume. Chris Maguire was the man dropped for Wyke. We got to East Midlands around two and a half hours before the kick off so we had plenty time there, however there's not exactly a lot around the ground. To be frank it's in the middle of an industrial estate. 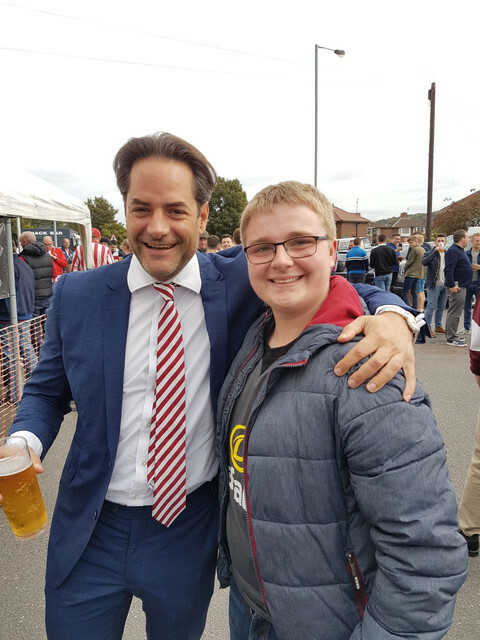 There's a McDonald's and a Costa Coffee just up the road but the Beech Inn Hotel was the place where most Sunderland fans congregated, including Charlie Methven! Charlie was more than happy to mingle with supporters and have a chat to everyone whilst he enjoyed a pint or two and his cigar. 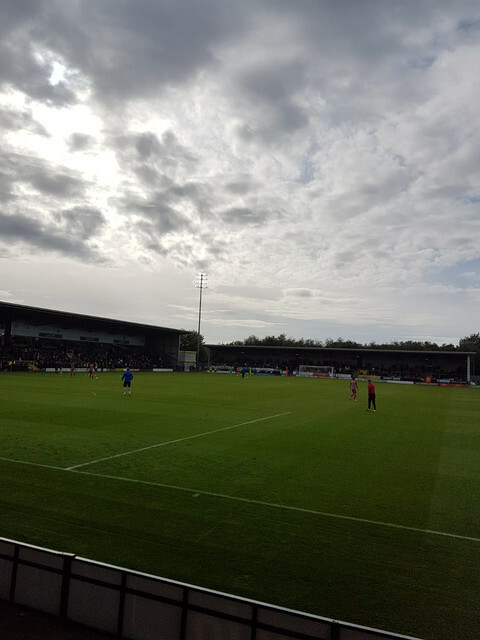 The ground itself is a relatively new and is a massive upgrade on what we've seen so far this season, mind you there's something I like about grounds like Kingsmeadow with it's old standing terraces and crash barriers, the old school feel around the place. However, the Pirelli is a decent enough ground and it's good to see a newish ground with a standing terrace behind the goal. Not up to much really! There were a few half chances but to be blunt we didn't even show up. As you may know I'm not Lee Cattermole's biggest fan, but booing him every time he got the ball – really? Apparently according to the bloke next to me. Burton took the lead through Jamie Allen after some easy running by Marvin Sordell on the right wing, easily beating Oviedo and the backtracking Josh Maja. Allen was left unmarked in the middle practically and free to tap it past Jon McLaughlin. 1-0 in the first 20 minutes again, only this time we barely responded. The lack of ambition meant there was only one team scoring next and it was the Brewers, this time from a cheaply conceded free kick. Glenn Loovens failed to pick up McFazdean who capitalised on the free header and put it past the statuesque Scotsman in goal. A quality delivery from ex Rangers man Templeton but a free header for the centre half who was left as free as a bird. Although he had not been great, Wyke going off injured was the last thing we needed. On loan goalkeeper Dimitar Evtimov, who only signed days before, went in for what was a 50/50 but he was a lot more full on than the big striker. A collision that would require a stretcher for the ex Carlisle forward. A nasty challenge by the goalie who was caught in no man's land and not even a free kick was given, just showing the standard of officials in this division. Jack Ross later confirmed our fears and that he'd be out for some time, possibly the full season. The second half started a lot better than the first, then again it couldn't have been much worse. Maguire took away Evmitov's clean sheet when his shot from the edge of the area flew into the top corner. The former Oxford United man had replaced Wyke after the first half horror tackle, he proved to be the difference second half but ultimately not enough. Few chances arose after that for boht sides, Albion were happy to sit back for the 2-1 win and we weren't exactly posing a huge threat – McGeady should've done a bit better with his chance but the Irishman failed to level things up when it mattered most. We seemed to have nothing in the midfield, certainly nobody who wanted it or who could string an attack together and any movement than contained Adam Matthews seemed to end up with us on the back foot. I hate to have a go at Lynden Gooch but he's just too greedy on the ball, always trying to beat that extra man when there's usually a better option. All in all, we weren't good enough and they wanted it more – it wasn't that they were on another level, although in effort they probably were. Matthews was appauling and just didn't look up to it, George Honeyman like I have said before doesn't look a leader and made no impact on the game. We need massive improvements all over the park and especially in effort – at the end the players didn't even look bothered and some shot straight down the tunnel; I don't agree with booing them but it was far from their best performance to say the least. The crucial thing is to actually start on the front foot now, rather than being frightened to concede and then start attacking. Getting past that first 20 minutes without conceding is key and to be perfectly honest, we need to start playing as a team. We've not looked great this season despite results. Yes, the mood has changed with this new chapter but the optimism won't last with narrow wins and home draws. Yes, we were always going to be beaten some point this season but not without fighting; or so you'd hope. The last time I can truly say we played good football was Scunthorpe United at home; Gillingham we scored 4 but they could've done the same, we just took our chances. We need to tighten out defence and stop shopping goals. McLaughlin: 5 - didn't have much to do and wasn't really given a chance for the goals. Matthews: 3 – very poor defensively and attacking, rather have had Hume or Flanagan there. Loovens (O'Nien ’86): 4 – left McFazdean unmarked for their second, didn't have a clue where he was. Baldwin: 5 - didn't do much right or wrong. Oviedo: 5 - should've stopped Sordell for their first. Cattermole: 5 - wasn't great but didn't deserve the abuse he got there. Honeyman: 4 – not a leader and just didn't have an influence. Gooch: 4 – tries to always take on that one extra man. didn't do it enough though. Maja: 5 – played him on the wing. What is it about Sunderland AFC playing strikers on the bloody wing? Wyke (Maguire ’43): 4 – was poor but a horror tackle by their keeper ended his day and season a lot earlier than expected. Hope he is okay. Maguire: 6 – changed the game but wasn't fantastic. McGeady: 5 - didn't do much, just back from injury so looked rusty, then again he's not exactly a hard worker. Should've scored. Thanks for reading - I'm on Twitter @ethan_thoburn or go and follow @WeAreWearside.